This recipe is credited to Jessie Lundell. Once melted, add milk, vanilla, egg and yolk. Stir until combined. In a seperate bowl combine dry ingredients. Pour wet mixture into dry ingredients. Stir until just moistened. Wash blueberries, pat dry (take care to remove all stems!). 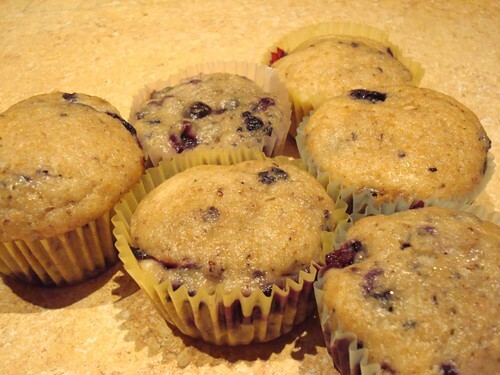 Toss with a bit of flour to prevent them from sinking to the bottom of the muffins. Fill lined or greased muffin tins to the top. Bake for 18-20 min or until toothpick inserted into the center of a muffin comes out clean. *I do this in a small bowl or large measuring cup in the microwave. 1. I always remove salt from recipes, so naturally I didn't include the salt in this one either. 2. I love using the egg shell to separate out my egg yolk. Makes me feel like a fancy pants cook. This also means this would be a great recipe to bake fresh one morning, you could add some more eggs to that egg white and have some scrambled eggs. Mmmmm. 3. The first few times I made these I didn't have any wheat flour on hand (honestly? Didn't even know you could buy the stuff.) so I just used regular white flour. This last time I actually bought the wheat flour. It's much better with the wheat flour, they are too sweet without it--almost more of a dessert. So go pick up a little bag, it's totally worth it.